If you've ever left your MP3 player at home because you were going to the beach, boating, swimming or other activities that could get things wet, you don't have to any more. 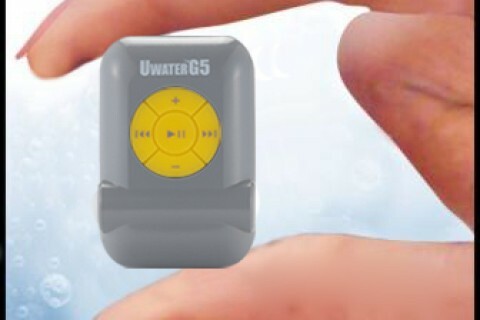 The UWater MP3 / FM Radio is 100% waterproof to 10 feet and holds an impressive 4GB of music. That's around 1000 songs or 10 audio books, depending on length. The Li-Ion rechargeable battery is built in and gives you up to 8 hours of play time. It comes with USB cable, waterproof ear buds conveniently marked with L and R and a slide on clip on the back so you can attach it to pretty much anything within reach, goggles, bathing suit strap, arm band etc. The unit itself is TINY with smooth rounded corners and has high contrast, bright yellow control buttons with obvious user control markings in black for easy use. The earbuds are angled and marked with L and R and you can choose from 4 different sets of included silicone tips to get your best fit. Charging is as simple as you'd expect, just plug in the included USB cable to your computer or charger ad wait for the indicator light to stop flashing. It took just under 2 1/2 hours on my laptop. Now for the important part - the sound. It is excellent. It's full and not tinny at all and even the radio (usually iffy here due to mother nature) came through nice and clear.